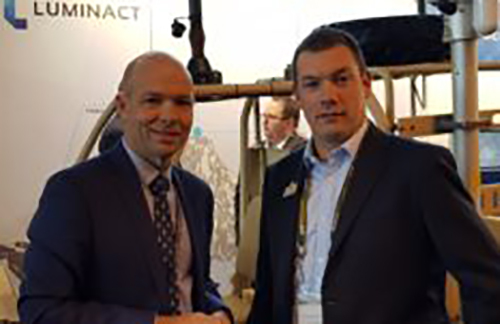 Two of the UK’s leading innovative SMEs, 2iC and Bodytrak®, are collaborating to deliver an integrated body monitoring platform to provide real-time well-being data from military and emergency services personnel while in action. By combining 2iC’s multi-device “plug and play” capability and integration know how with Bodytrak’s ability to accurately measure multiple physiological parameters along with activity via a single device, the partnership will deliver unparalleled situational awareness and critical well-being insights to clients. Through initial DSTL funding, Bodytrak has developed the first and only unobtrusive body monitoring platform that can accurately monitor core body temperature and heart rate, whilst also continually tracking heart rate variability, oxygen uptake (VO2) and motion metrics. The automated Bodytrak platform then provides real time insights into the health and wellbeing of soldiers and emergency services personnel, allowing early intervention via ill-health alerts. In addition, the Bodytrak earpiece incorporates two-way communication capability as well as ambient sound transparency, which allows the wearer to maintain situational awareness. The companies’ collaboration started in late 2015 with a Proof-of-Concept (PoC) for UK police forces to enable the open and flexible integration of low power devices typically using microcontrollers. The project demonstrated how police forces could access critical wellness in the field, on handheld devices, and also HQ locations to improve situational awareness and officer wellbeing. The 2iCBodytrak partnership now adds even greater utility to the Bodytrak earpiece by enabling quick and secure connections to other devices and systems in challenging physical environments where power and bandwidth are often scarce. The Bodytrak device is due to be trialled by the MoD. Commenting, Bodytrak CEO Leon Marsh said “combining real-time personal well-being and situational information with other sensor/systems inputs into the decision-making loop can only improve operational effectiveness and safety of front-line personnel”. 2iC CEO, Graham Booth, added “it’s great we are able to do all this without worrying about comms, power, weight or interoperability issues. It’s a simple open standards plug and play solution, quickly deployed and rapidly changed”. Booth also reported that the 2iC-Bodytrak solution is already attracting interest from other sectors notably global health organisations seeking technology to monitor vital signs of inhabitants in remote tropical areas vulnerable to mosquito borne diseases.